The UK government is facing the task of urgently reducing a national budget deficit of unprecedented size. The core challenge for public sector leaders is to make the 'right decisions' about where to cut spending and where to invest. Public Sector leaders need reliable data and information management tools to assist them in effective decision-making, ensuring long-term savings while protecting front line services. The government must therefore urgently review the ways in which it collects, analyses, exploits and shares information. 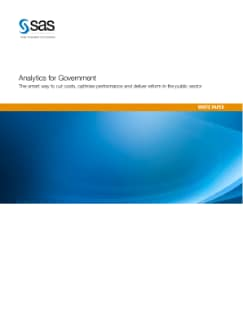 Learn how SAS Analytics can help Public Sector leaders manage the savings required by the CSR, without sacrificing the fairness or the services that the taxpayer deserves.